It has been almost a month since Ethereum [ETH] price has seen the $500.00 level for the last time. However, since Thursday April 12, are reversing majorly in price with double digit gains in a weekly bases – ETH +30.00% in the last 7 days. To reach today’s trading ground, the pair ETH/USD failed once on April 12 but the achieved supports of $480.00 did hold steady and made sure in any moment the important $500.00 will be broken. 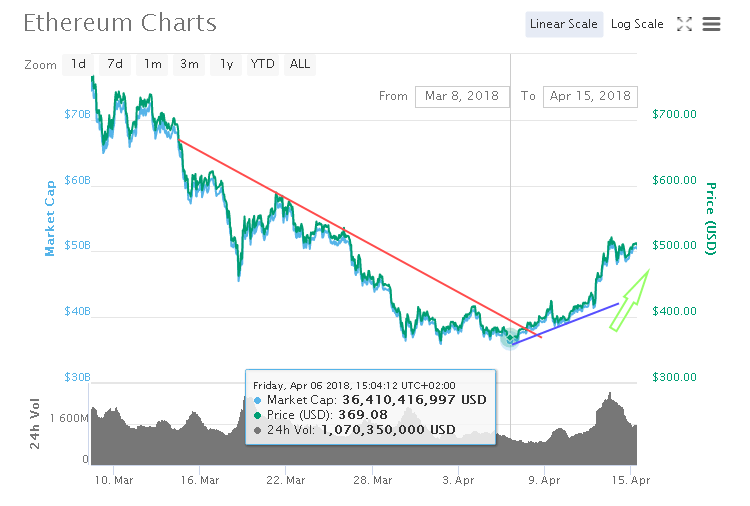 As the value has overextended from the bullish trend line on the 4-hours chart at $460.00, there could be a backtrack but as long as it stays above the level we can see the continuation of this nice uptrend and it could even test the $575.00 in the very near term. On the upside, the price must break the recent high at $530 to start a fresh upside wave. The next hurdles on the upside above $530 is close to the $575 level. Many do believe that with the start of the second quarter bulls are in line to take helm and lead the show. one of them that supports the idea strongly is Tim Draper, who recently stated that he believes bitcoin could reach a quarter of a million dollars by the year 2022.